If you are a serious quilter, or just want a cutting machine for fabric, we will show some of the best die cut machines for fabric and felt. The best kind of machine for cutting fabric and felt is going to be a manual die cut machine. 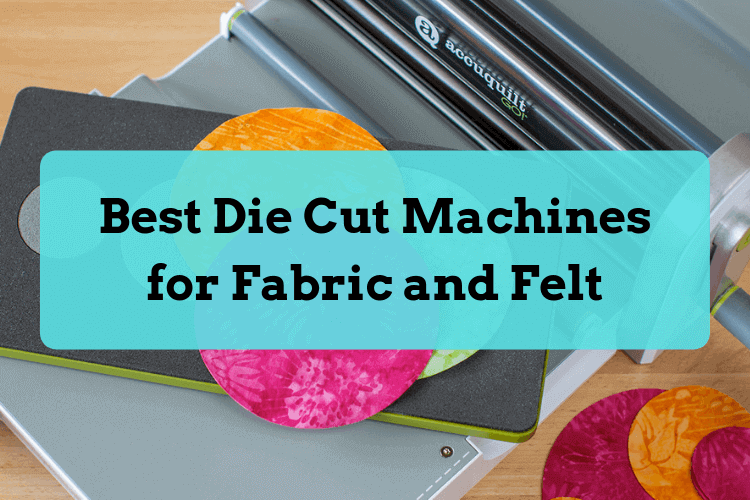 A digital die cut machine will work, and it may be a good option if you only need a few pieces cut now and then, but if you want to cut anything more than a few pieces of fabric, a manual die cut machine is better. No cutting mat. A manual die cut machine, unlike a digital machine, does not require a mat. If you do use a digital die cut machine to cut fabric, you have to make sure the mat is very sticky. Simplicity. There are no blades that can become dull and no need to spend time experimenting with various pressure and blade depth settings. Cut multiple layers of fabric. A manual die cut machine can cut multiple layers of fabric at once. With a digital die cut machine, users are limited to cutting one layer piece at a time, but some manual machines can cut up to 10 layers at once. Freedom to cut bigger dies. 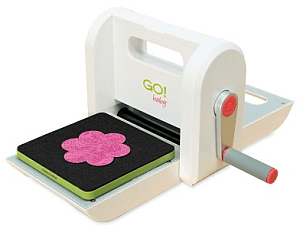 With the Bigz dies from Sizzix, users can cut pieces 2 feet in length. 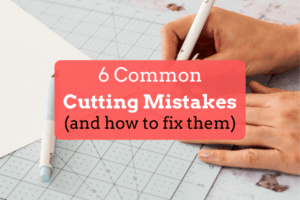 Machines like the Cricut Cuttlebug and Spellbinders Grand Calibur are some manual die cut machines for cutting fabric, but they aren’t the best. These machines don’t have a large working platform and aren’t as well built as some other machines on the market. The Sizzix Big Shot is a great machine. 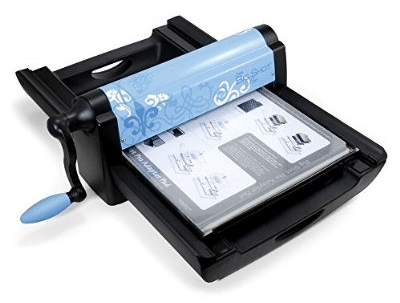 It’s one of the smallest Sizzix machines, being able to cut 6″ wide, so if you are looking to cut larger pieces of fabric, there’s also the Big Shot Plus machine (cuts 8.5″ x 11″), or the Big Shot Pro, which has a 13″ wide opening. The Sizzix Fabi and Sizzix Big Kick machines are identical to the Sizzix Big Shot. The Fabi machine comes with different items. The Accuquilt GO! Baby is an affordable is a great solution for beginners. The sides of the machine fold up and weighs only 8.5lbs, making it super easy to use the carry handle to carry it around. This Accuquilt cutter can cut up to 6 layers of cotton at once. The Accuquilt GO! is a step up from the Accuquilt GO! Baby. The sides of the machine fold up and weighs only 15lbs. 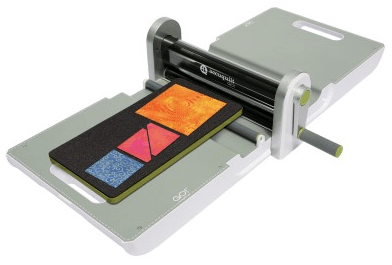 This Accuquilt cutter can also cut up to 6 layers of cotton at once, but can take 10″ x 24″ inch dies. The Sizzix Big Shot Pro is the Big Shot’s bigger brother. If you are interested in a Sizzix machine but want a larger machine for quilting, then the Big Shot Pro is a good choice. The machine is heavy, weighing 44lbs, so it’s not as transportable, but it certainly is sturdy. The machine has a wide 13″ opening and a large working platform, making it easier to prepare your cutting dies. The Big Shot Pro can cut up to 8 pieces of fabric, which means huge time savings. If you are planning on cutting long pieces of fabric that are 2 feet in length, then you’ll want to get the machine with the extended accessories. If you really want some automation for lots of fabric cutouts, consider the Accuquilt GO! Big Electric Fabric Cutter. This fabric cutter machine is automatic, which means there is no handle to crank. The Accuquilt GO! Big Electric has a wide 14″ opening, which means it can handle two dies at once, cutting up to 6 layers of fabric on each die. The Accuquilt Studio Fabric Cutter is specifically designed for quilt shop owners and professional and avid quilters. The Studio machine has the largest cutting width on the market, being able to cut up to 16 inches wide. The machine can also cut up to 10 layers of fabric at once. When you are using multiple dies, that means you can make hundreds of pieces quickly. To save space, the machine has a foldable base, making it easier for storage. What die cut machine is best for cutting fabric? The best die cut machine for fabric is going to depend on a few factors. How much fabric will you be cutting? If you aren’t going to be cutting a lot of fabric, consider the Sizzix Big Shot. The Big Shot can die cut, and also emboss. It can also work with dies from other manufacturers. However, if saving space is more important to you, consider the Accuquilt GO! Baby instead. If you are looking for something that is larger and you don’t need anything fancy, the Sizzix Big Shot Pro and Accuquilt GO! are great machines that are wide and can cut several layers at once. If you are looking for something even more heavy duty, then consider the Accuquilt Studio, which can cut up to 10 layers at once. What machine do you like best? Leave us a comment! What kind of fabric waste is there when using these machines? Hi, In my opinion, very little. I have had the Accuquilt Studio for about 12 years and I am going to find some way to take it with me when I go (no pun intended). If you are cutting strips or squares the only waste is what is needed to overlap a bit to allow for the cut. If you are cutting appliques I don’t find any more waste than I would if I were cutting the pieces one at a time by hand and it’s certainly faster and more accurate.. Which machine will allow you to cut multiple squares/shapes of the same size at the same time, e.g. six 1 1/2″ squares at once, not counting layers of fabric. Can the cutting tools you offer cut fabrics like silk, do you sell cutters that will make flower petals only? you can purchase accuquilt machines from create and craft which is on freeview tv, but remember sizzix dies are cheaper and will cut acccuquilt dies, their larger cutting machines are cheaper than the accuquilt, I have a big shot and also a cut and boss which is an A4 electric die cutter that will cut every die apart from larger than a4 dies, which i love. I have written to sooooo many companies and asked about the use of accuquilt dies in a sizzix machine. I have the BigKick and wanted to purchase some accuquilt dies from Sue Spargo. No one could help. Again, thanks for this helpful information. I am going to pass it on to others too. What machine would be best to cut felt? sizzix will cut felt, thick card, thin paper etc and drink cans and six to eight layers of fabric, also Hocanda on freeview support sizzix die s and it is great to watch how they work on television. Nice for this machine, but we can use it for business? I want to know about the speed of this die cut machine. I prefer the die cut machines that can cut fabric. Is it for personal use or for commercial? What is the best way to cut large large plain alphabet letters from fabric & bonding, each one needing to be about 7cm tall & a very plain font with square corners? Do I need to buy an electric machine such as the Sizzix Eclips or is there a less expensive way other than doing it by hand which is what I have been doing? Need to speed up the job & work a bit smarter! Will any of these machines/manufacturers allow for custom dies? I need about 3500 cuts of one shape, but it is for r usable sanitary pads with wings. We have the shape, but cutting them by hand is taking a very long time. We have 2500 cut and 3500 still to go. I Found a company on Aliexpress that cuts custom dies for the Big shot, Big shot plus and Big shot pro. So far iIhave gotten reasonable quotes from them. I havent orderd yet but may be worth a try. their email contact is Catharine Wang, gusujinfang@foxmail.com. Did you end up ordering this? Did it work out? Nothing was mentioned about felt sheets. Which is best for felt, what thickness of felt can be used on dies. I really like the accuquilt, but I need it to be versatile for both fabric and felt. Crossover II by Crafter’s Edge has adjustable rollers – so you can cut anything from paper, fabric, thin metal, leather, etc. with their dies. Can use other brands’ dies with adapter plates, but Crafter’s Edge has a big selection of the deep-etch dies, AND they’re less expensive and take up a lot less room than those big, heavy steel-rule dies/boards! Check them out! 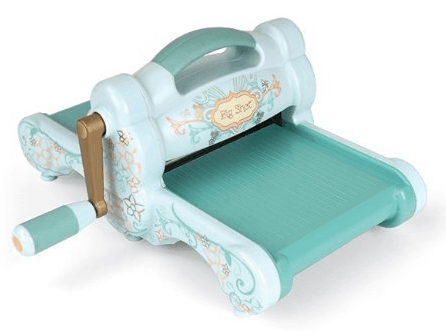 HELP…I am looking for information on the Crossover Die Cutters and if they will work in the Sizzix Big Kick? I have found a pdf on compatibility but does not list the Crossover, so that was not helpful. I researched the Crossover Cutter and no that other manufacture dies are not compatible with their machine. BUT, I am looking for use of the Crossover cutting dies with the Sizzix Big Kick. I am holding a purchase until I know the answer. Thank you in advance for assistance in this dilemma. Seriously people get the Cricut Maker with a rotary blade and cut any fabric any size and design you like no limitations or expense with existing dies! I’ve trued all the machines manual and electric and believe me the Maker will make all your cutting dreams come true! Heather, yep, the Cricut Maker can be a great choice as well for cutting fabric! Available on Amazon and Cricut.com. Thanks for the suggestion! The Cricut Maker with the rotary cutter is the machine to use for cutting fabric! However, Design Space is very limiting. Apparently intentionally it will not accurately dimension-wise import SVG design files generated elsewhere. Obviously the are twisting one’s arm to purchase their designs. There are ways around this limitation, but cumbersome. If only one could use Sure-Cuts-a-Lot (SCAL) easily in conjunction with the Maker. Cricut even went to court in order to prevent SCAL from being directly compatible with Design Space.